Things are incredibly busy here at J-D Design at the moment, however when we were approached by the organisers of TEDxPalosaari in need of sponsorship for their domain name, website and emails we couldn't turn them away! TEDx is a process allowing a group of event planners to self-organise independent "TED" talks in order to gather inspirational people of likeminded topics to present their experiences and passions in order to spark deep discussion, connection and engagement. They are definitely events you want to support, as these are usually featuring highly experienced & diverse people in all kinds of different fields. There are various different rules and regulations in place for a TEDx event, due to them being self-organised using the TEDx branding it's important these TED-like events achieve the same high quality of experience as official TED events. TEDxPalosaari is a first in its kind event to be hosted in Vaasa, Finland. 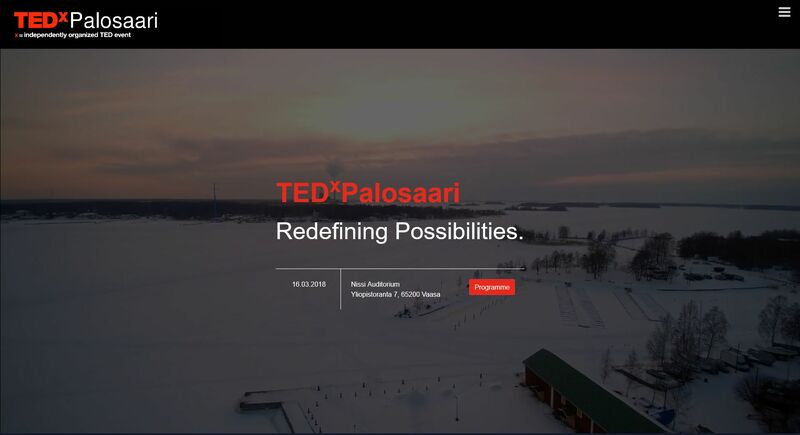 Organised by a group of similar-minded international business & marketing students, TEDxPalosaari will be themed around "Redefining Possibilities". This will allow the event to attract a variety of speakers from various backgrounds and sectors, such as Education, Technology, Start-ups, Sports and Media. What did J-D Design Provide? Over the course of the last few months, J-D Design has registered tedxpalosaari.com, provided the organisers with professional matching email addresses, designed an event website for them and also provided them with the J-D Design Superfast Website Management System to ensure their website can easily be updated by the team regularly, while remaining super-fast. The team have been hard at work for their 2018 event which is set to take place on the 16th March at Nissi Auditorium, Yliopistoranta 7, 65200 Vaasa. For enquiries, suggestions and feedback be sure to visit the official TEDxPalosaari Website. If you have a non-profit, charitable or world-improving startup, idea, business or concept - get in touch with J-D Design. We take great pride in supporting people who aim to make the world a better place.